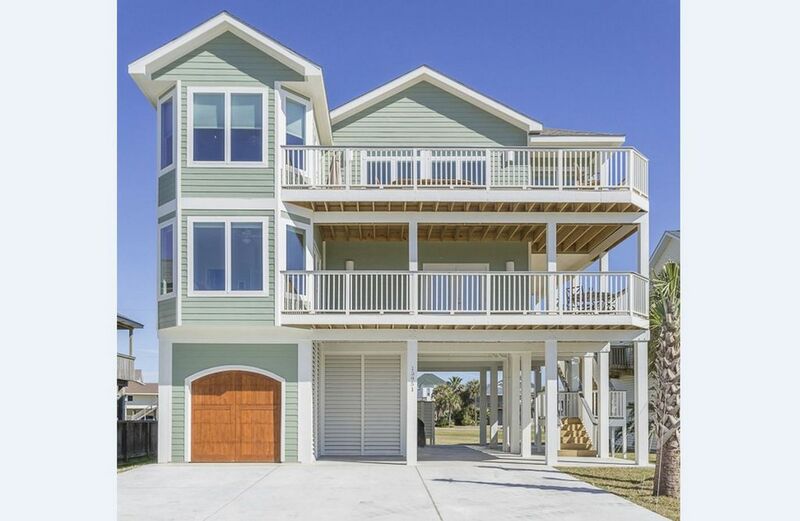 THE BEACHHOUSE is a beautiful 5 bedroom home that includes a 5 pax golf cart! Welcome to THE BEACHHOUSE! We designed our new 5 bedroom, 4.5 bath beach home with a reverse plan layout, perfect for vacationing and entertaining with family. The living room, dining area, kitchen, island & bar along with our king master ensuite are all on the top floor. With over 400 square feet of top floor deck you will enjoy sunrise over the Gulf of Mexico and sunset over West Bay. On the first floor there are two queen master ensuites and two additional bedrooms sharing a full bath, all with access to a large wrap around, covered morning deck. Our ensuite king master has a 50 inch smart HD TV with French doors that open to the large deck with views of the Gulf of Mexico. The two ensuite queen masters give you the comfort & privacy of a luxury resort. We have tried to include the niceties of your home in our beach home with granite counter tops, large walk in showers & plenty of closet storage. The fully equipped kitchen comes complete with Frigidaire Professional appliances, granite counter tops, large pantry and plenty of areas for socializing. The large granite top island will comfortably seat five, while the dining table with two extensions will seat ten comfortably and the bar is close by. The living room is a great room for comfortable conversation, listening to your favorite music, watching TV on the 65 inch HD 4K smart TV with included XFINITY programming... or simply enjoying a good book on one of the comfortable sofas. The house has an interior stairway to the second and third floors and an exterior stairway has access to the first floor deck. In addition, for your convenience with luggage and groceries we have installed an internal cargo lift. The ground floor is a great gathering place for BBQing, games & socializing. We have available for your use a large Weber BBQ, propane included. Included with your rental is our Cub Car 5 passenger golf cart making trips to the beach a breeze for you to use responsibly during your stay at no charge. We are family friendly. We do not accept vacationing students, noisy groups or events on site. You must be 30 in years or older. Sorry, but no pets, no smoking, and no motor homes. Low key, respectful guests only, as Pirates Beach is a nice quiet upscale beach community. Just bring your flip flops and beach towels. THEN ENJOY!! We have raised our family in Pirates Beach and have owned a number of homes here over the years. We chose to build a new home for our extended family and we wanted to share our beach home with others thru VRBO. THE BEACHHOUSE is located on a quiet cul de sac that gives you privacy and quick access to the beach. We also have available to you our 5 passenger golf cart, beach chairs, children's sand toys, a beach cooler, pack and play, bumble seat, high chair and boogie boards. We try to provide as many amenities as we can so parents can actually relax! The large walk in showers have floor to ceiling tile. A short walk to the beach or load up the golf cart with beach chairs & coolers. High speed XFINITE thru out the house with extender. Two coffee makers. One Kuerig and one drip machine. Trash Compactor. Bar area with bar sink and under counter beverage cooler. Large WEBER BBQ with LP gas included. We enjoyed our stay at this lovely home. Very spacious and clean. Nice comfy beds. Handy to have the golf cart. Travis was very helpful. Thank you, Marty and Jean. Clean, everything worked, new appliances and nice home. Thanks for sharing your home with our family. The house was wonderful, everything we needed. We had a great time at the beach, extremely close and the golf cart made it easy to go back and forth. The third floor deck was great at night to enjoy the sounds of the waves. Can’t wait to come back. Excellent location and absolutely everything you could need! Clean and comfy. Beautiful home and owner's thought of everything you need! This is a beautiful home with high end appliances and fixtures. Everything is clean and in excellent working condition and the owner's have thought of everything you might need. We spent a week with our three children, their spouses and two grandchildren and never felt crowded nor like we were having to "make do". The golf cart they provide is the perfect (and fun) way to make the quick trip to the private beach. It's a quick trip in to town to visit Moody Gardens or any of the other Galveston sights. This is our second time to stay at THE BEACH HOUSE and we will most likely return again next year. Our stay was perfect and the house is beautiful and located close to the private beach area. The kitchen is gorgeous with great appliances and is stocked with great dishes, utensils, cookware and almost cocktail glass you could need. The house was very clean and beds comfortable and spread out rooms where we didn’t feel on top of one another. Will definitely be back!! The owners are great and provide great service for whatever you may need. GO TO GALVESTON.COM. To view the many exciting things to see & do on Galveston Island. There is so much to do we could not list them all. Cancellations Fees: 60 to 15 days prior to arrival 50% of rental fee, 14 days or less no refund. If we find a suitable replacement rental, you will receive a full refund. Damage deposit will be refunded 7-10 days after your stay.